The life of my beautiful ornament wreath came to an end and is now in the trash. Wind, crushed ornaments, etc. It was a sad day since it was my all time favorite Christmas wreath and it lasted for almost two holiday seasons so I guess I can’t complain. I think I’ll get more ornaments after Christmas on clearance and make another one next year. 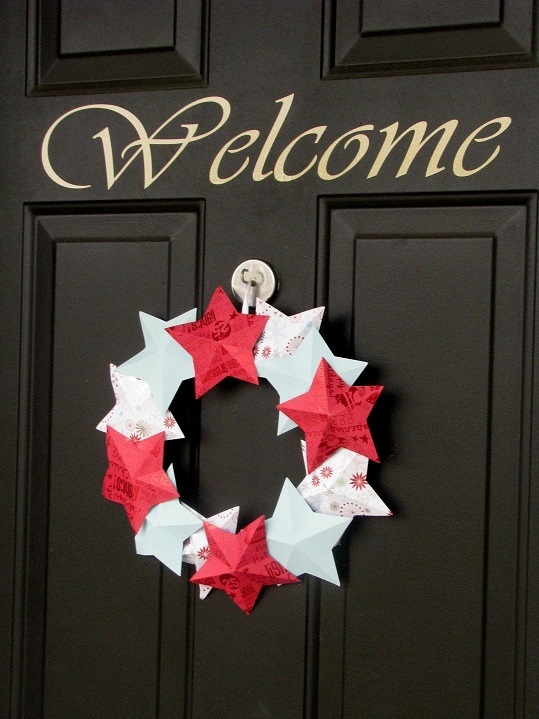 But my front door still looks pretty because I pulled out my trusty 3D Cardstock Wreath that I made as a demo for a class I taught recently. It was perfect, bright, and popped against our black door. These wreaths are SO easy and quick to make. I found these fun papers at Joanns for .25 each. The colors are in a wintry hue so I think I’ll leave it up for January too. 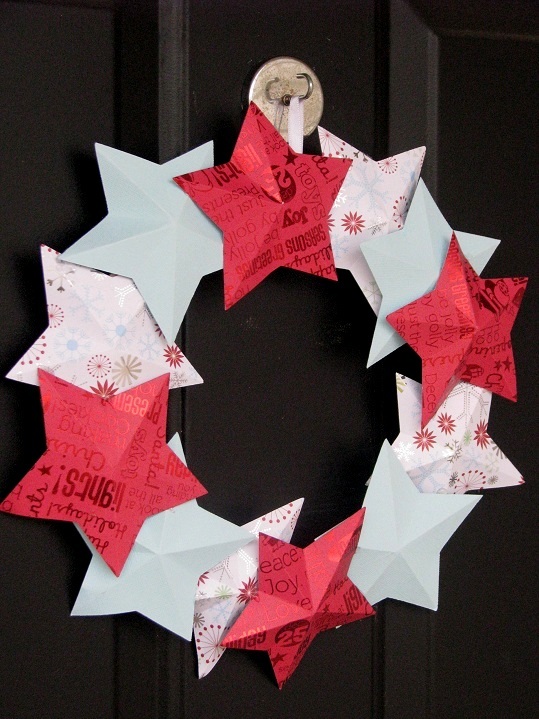 Too bad about your gorgeous ornament wreath but your cardstock star wreath is lovely. Your black door has me looking at mine in another light, too. Clever decorating! Love it! 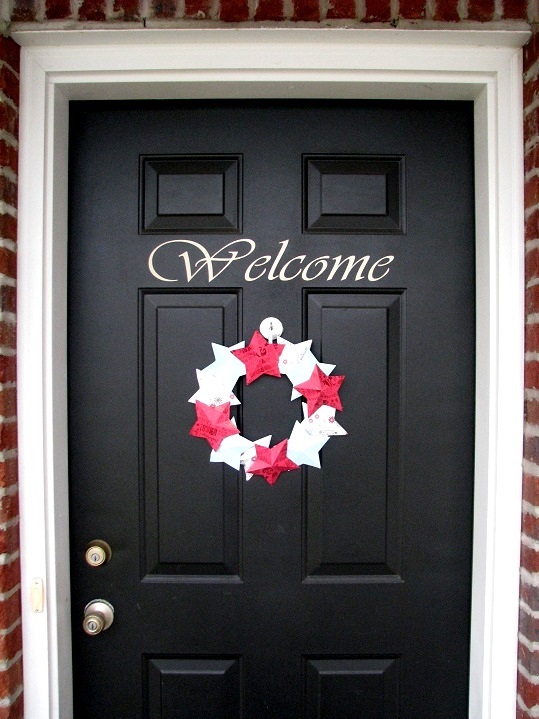 and love the “welcome’ decal. Just put mine I got up and love it! Makes your door so warm and inviting. I saw your creation on Uncommon Designs. Your star wreath is gorgeous!! I really like those papers!! And I like that a child could make this as well. I am no. 94. Please visit? What a perfect wint’ry wreath. for sure – leave it up for January. It is very striking on your black front door! Beautiful wreath! And I love the welcome sign – is that vinyl? I want to do that when I get my own house!! That’s so fun looking! 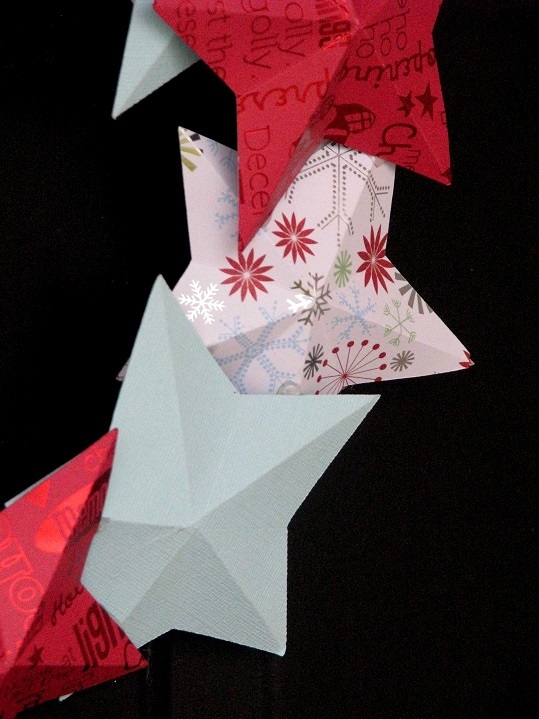 I can’t believe it’s cardstock! Would you consider sharing it here if you have the time?